Transform the overall appeal of common spaces with distinctively bold, Huntington Collection 32 gallon trash receptacles. 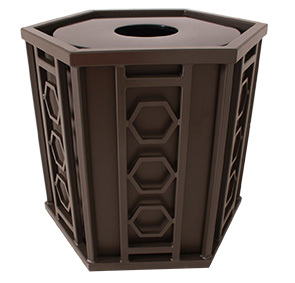 Inspired by mid-century geometric design infused with a modern industrial flair—these large capacity receptacles are ready to help create clean, professional indoor and outdoor areas. All-steel construction finished with an ultra-resilient powder-coating that protects the receptacle throughout the rigors of daily use and continued exposure to environmental conditions. Made ready for a variety of applications with three lid options to choose from, each engineered specifically to maximize disposal access and properly conceal contents.